We're proud to present the stories of two Upward Scholars students, each of whom benefited from Upward Scholars support in very different ways. These students presented their stories at Onward and Upward, our June 2 fundraiser and celebration. You can watch all six of our students telling their stories here. Lalima shares the story of her journey and how Upward Scholars has helped her along the way. Silvia shares the story of her journey and how Upward Scholars has helped her along the way. The Upward Scholars Conversation Club is an informal gathering where Upward Scholars students and members of the Upward Scholars community meet to chat. We started the club to give our students the opportunity to practice English in an informal setting and to give community members the opportunity to get to know our students. 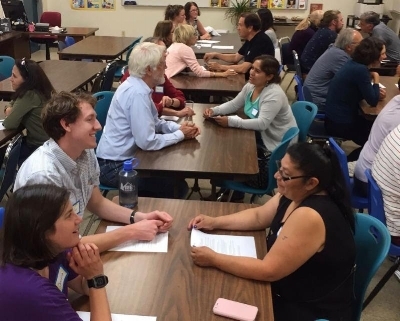 We use a "speed-dating" model, where Upward Scholars students and community members pair off and chat for about 10 minutes before moving on to the next person. That way everyone has the opportunity to chat with multiple conversation partners. When: Friday, July 20th, 7 - 9 p.m.
Where: Sequoia Adult School, 3247 Middlefield Road, Menlo Park. Parking: In the parking lot behind the school; access from Sixth Avenue, around the side of the school and through the gate. If that lot is full, park across the street at Garfield Charter School, 2300 Midddlefield Rd. Please RSVP here by July 6th. If you're not sure you can make it, sign up as a "I think I can" to give us an idea of how many students to invite. If you're an Upward Scholars tutor, and want to encourage your student to attend, the student RSVP is here. You don't need to RSVP if you can't attend. Recruiting Upward Scholars Tutors for Fall! We need more tutors for fall! If you'd like to know more about our tutoring program, send an email to info@upwardscholars.org. And please spread the word among friends. Most Upward Scholars tutors help students with intermediate and advanced ESL classes. We also have tutors who work with students on math, programming, and college-level English. The time commitment is about 90 minutes a week at a time and location that's convenient to you and your student.